BOWLING GREEN, Ohio – No. 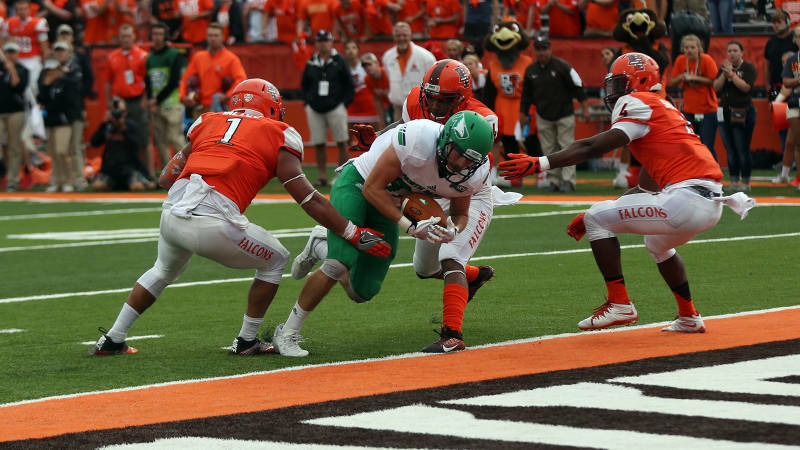 25 North Dakota was a two-point conversion away from pulling off back-to-back wins over FBS opponents, but Bowling Green survived the late rally by the Fighting Hawks to register a 27-26 victory at Doyt Perry Stadium. Sophomore Keaton Studsrud drove his team down the field on an 11-play, 65-yard touchdown drive in the final minute to leave coach Bubba Schweigert with a decision to make. The third-year coach opted to go for the win on a two-point conversion, but Studsrud and Stetson Carr, who had connected on the scoring play to make it a one-point contest, could not do the same and the Falcons (1-1) escaped with their first win of the season. Studsrud capped the drive with a 3-yard strike to Carr, who hauled in his first collegiate touchdown in dramatic fashion. It came on a third-and-goal pass with 13 seconds left on the clock. After the failed two-point try, UND went for the onside kick, but Bowling Green recovered and ran out the remaining time. After both teams traded three-and-outs on their opening possessions, Bowling Green struck first and in a hurry as James Knapke connected with Scott Miller on a 71-yard touchdown reception on the first play of the Falcons’ next series. Ronnie Moore would put BGSU up 14-0 on the home team’s next possession with a 3-yard touchdown run. The 14-point advantage would be the largest of the day for the high-octane Falcons. Studsrud finished 21-for-36 for 219 yards and a touchdown, while sophomore John Santiago rushed 18 times for 119 yards and a touchdown to pace the UND offense, but it was the Fighting Hawks’ defense that gave the visitors a shot in the final quarter. The teams exchanged missed field goals before Reid Taubenheim put UND on the board with a 36-yard field goal after Deion Harris had the first of his two interceptions on the day. Harris returned his second of day 61 yards for the Fighting Hawks’ first touchdown of the game. The junior’s pick-six made it a 14-10 contest with 1:49 left in the first half, but the visitors would keep the momentum for only 44 seconds. Knapke returned to quarterback for BGSU and once again found Miller on a deep scoring strike. This one came from 51 yards out and gave the sophomore four catches for 150 yards in the opening 30 minutes. UND would run out the final minute of the half and going into the lockerroom trailing 21-10. Santiago got the offense rolling in the third quarter as he set up a 21-yard touchdown run with a season-long 32-yard scamper on the opening drive. Santiago’s 100-yard rushing effort was the 10th of his young career and first of the season. Sophomore Tyus Carter came up with his first career interception on BGSU’s next possession and Taubenheim would get UND within a point once again, this time connecting on a 44-yard field goal that made it a 21-20 contest with 9:48 remaining in the third quarter. Knapke would drive his team down the field once again connecting with Miller on an 11-yard strike. Miller finished with five catches for a career-high 161 yards. BGSU would miss the extra-point, leaving the Falcons up 27-20. Neither team scored again until the final minute when Studsrud and company executed the two-minute offense to perfection. UND will return home next Saturday for its home opener against South Dakota in the 51st annual Potato Bowl. Kickoff is set for 4 p.m. CT at the Alerus Center. GAME NOTES: Luke Mathewson, Connor O’Brien, Cole Reyes and Keaton Studsrud served as the game captains … Deion Harris had his fourth interception of his career and first of season in the second quarter then got his fifth later in the quarter and returned it 61-yards for a touchdown … The last UND player with a pick-six was Brian Labat, who had a 35-yard return against Northern Colorado (Nov. 14) last season … The last UND football player with two INTs in a game was Chavon Mackey (at Idaho State; 10/5/2013) … Sophomore John Santiago posted the 10th 100-yard rushing game of his career with a 119-yard effort … He also had his second rushing touchdown of the season and 18th of his career in the third quarter … Freshman Travis Toivonen led UND with six catches for 58 yards, while sophomore Luke Stanley had five catches for a team-high 68 yards … Freshman Noah Wanzek had the first three receptions of his career for 36 yards … UND is now 1-7 all-time against Football Bowl Subdivision opponents … This was the fourth time in UND’s last five losses that the result was by six points or less and second time it was by one point (25-24 at Weber State; Oct. 17, 2015).